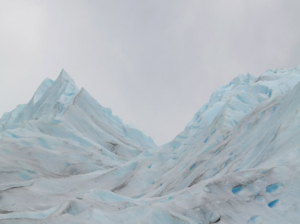 “Otherworldly” is how I describe our experience hiking Patagonia’s Perito Moreno Glacier. 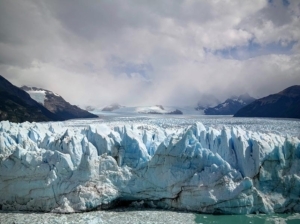 At 19 miles long and three miles wide, Perito Moreno is the third largest reserve of fresh water in the world…and it is one of only a few glaciers left that is still advancing. 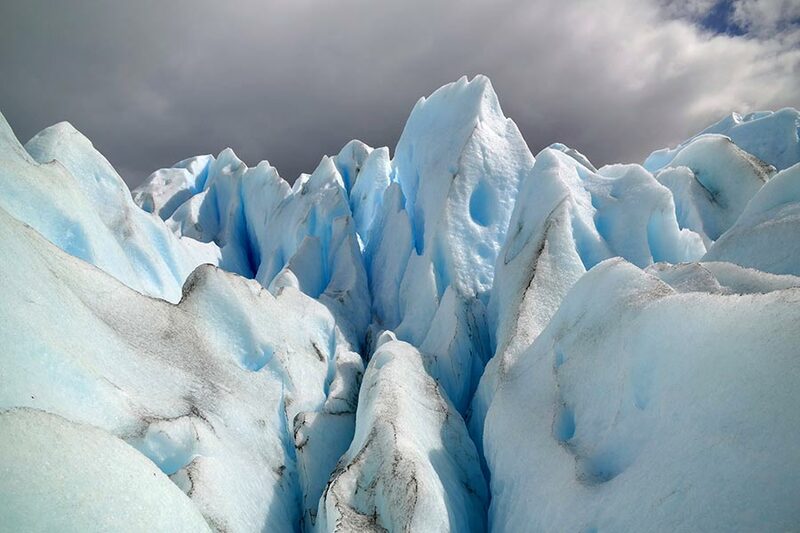 Upon approaching this colossus of ice, you see arêtes spiking to 20 stories above Lago Argentina – but the ice actually starts at a depth of 50 stories below the water level. 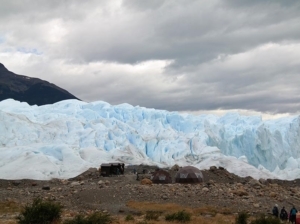 The glacier is surrounded by verdant peaks covered in rainforests. 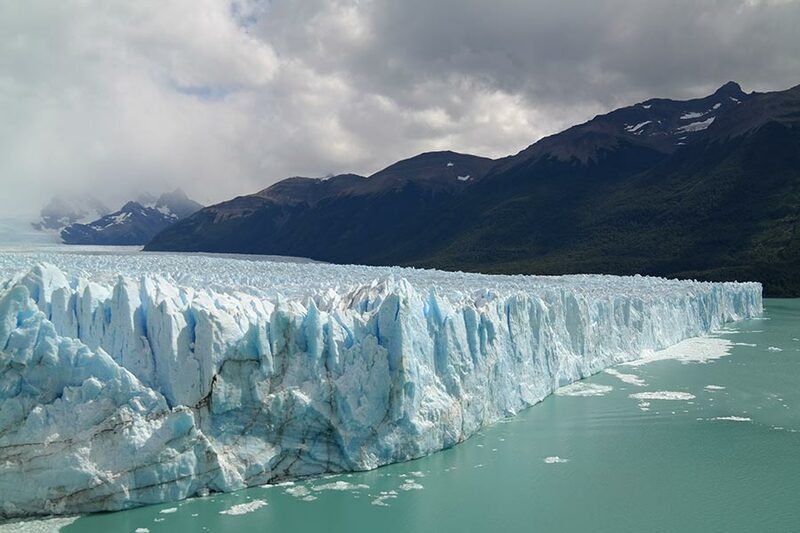 It’s a striking and unexpected dichotomy – the icy blue hues of the glacier and lake juxtaposed with the lush greens of the adjacent mountains. 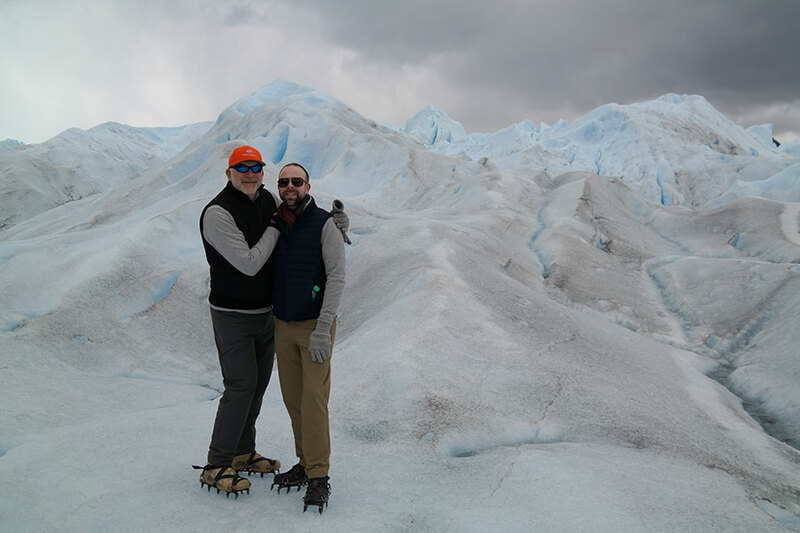 Charles and I started our adventure 50 miles east in El Calafate, Argentina’s gateway to Los Glaciares National Park, home of Perito Moreno. 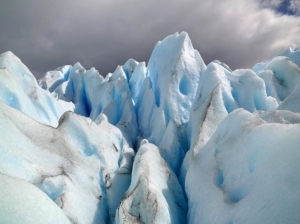 Located in the expansive Patagonian Steppe, El Calafate is surrounded by an almost lunar landscape, and considering how close it is to the inclement Austral Andes, I was surprised to discover that it rarely rains and never snows there. I was even more surprised to find lavender growing all throughout the town, but later learned that El Calafate sits at a latitude in equatorial equidistance to parts of France. It was all such an environmental enigma. Our day on the glacier started very early. 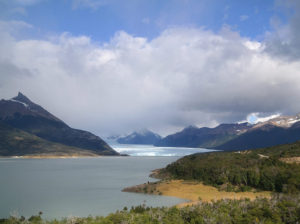 A bus picked us up from our hotel and drove us to a quay on Brazo Rico, the southern arm of Lago Argentina, where we took a boat across the lake, passing the southern wall of the glacier. Upon docking, we hiked with a guided group through lush forest and down to a rocky cove directly across from the glacier. 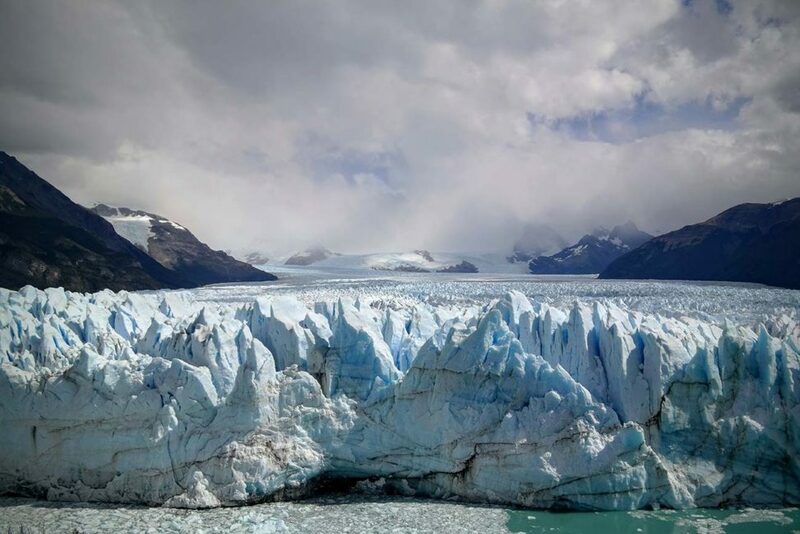 As our guide was giving us a history of the terrain, a huge chunk of ice calved from Perito Moreno, creating a sonic boom accompanied by a minor tsunami. 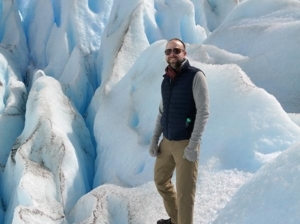 The guide, unfazed by the explosion, kept talking and casually mentioned to stay away from the water’s edge in the instance that a wave suddenly comes crashing ashore. We obliged. 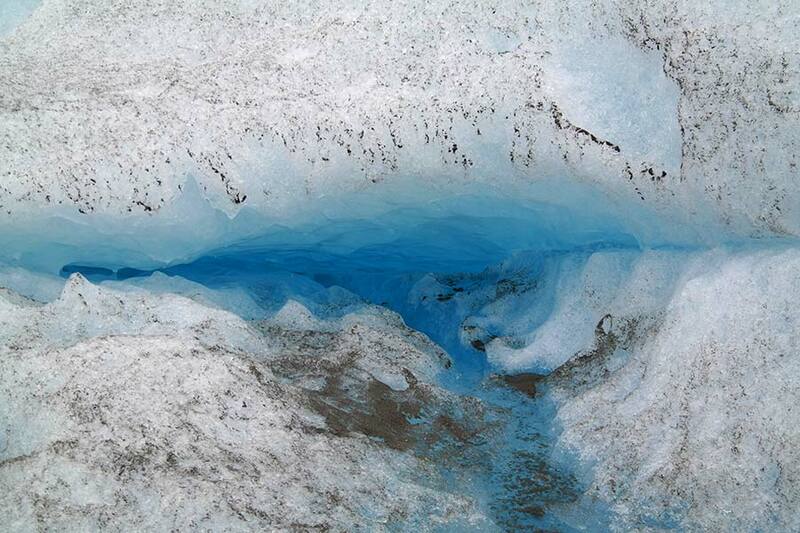 We continued along to a cluster of cabins located at the foot of the glacier. 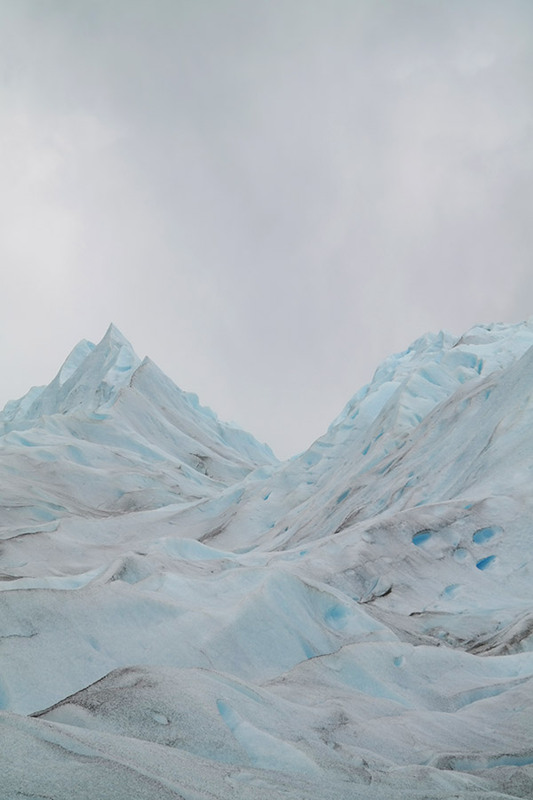 Here we were fitted with crampons before making our way onto the ice. The larger group split up into three trekking teams of twelve, each with two guides. 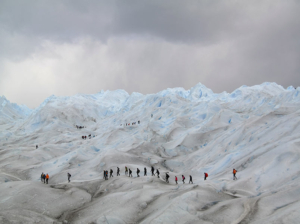 Without a moment’s notice, our guides had us trudging up the first incline and onto the glacial abyss. 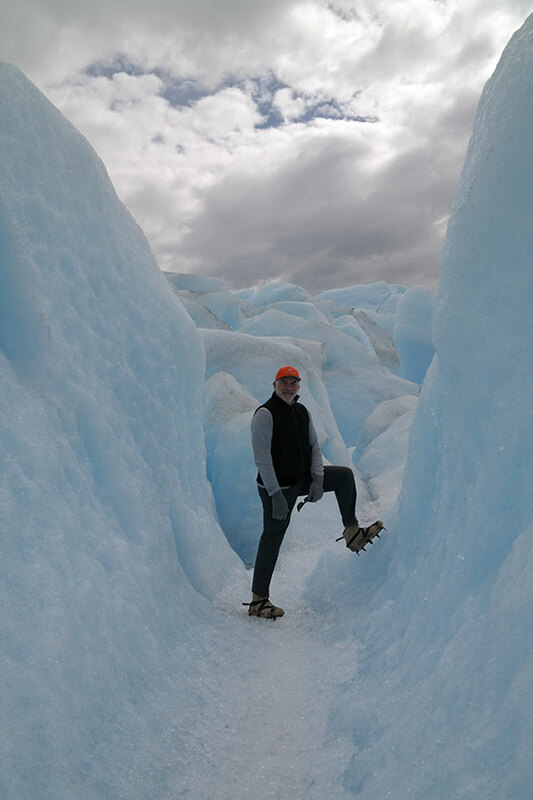 It took some time to adjust to the crampons, which are heavy and clunky. 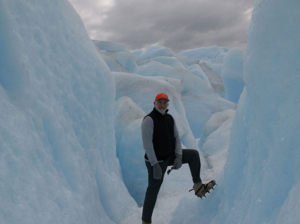 We were told to walk bow-legged to keep the crampons from hooking together. 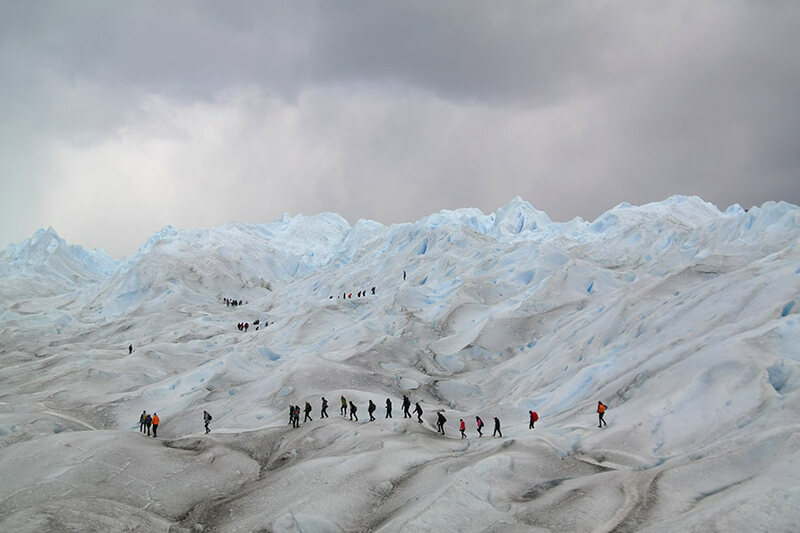 It was quite a sight – twelve of us walking single file uphill doing the “glacier walk”. 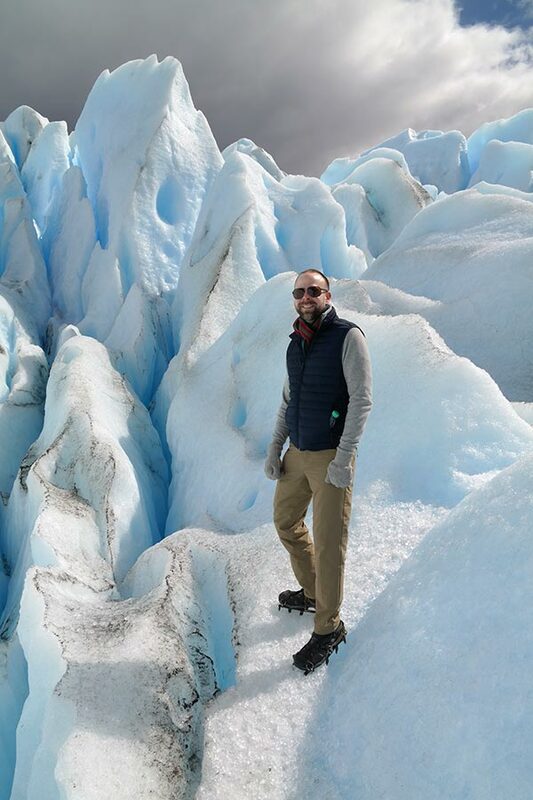 Our guides led us along natural pathways that followed the glacial ridgelines. 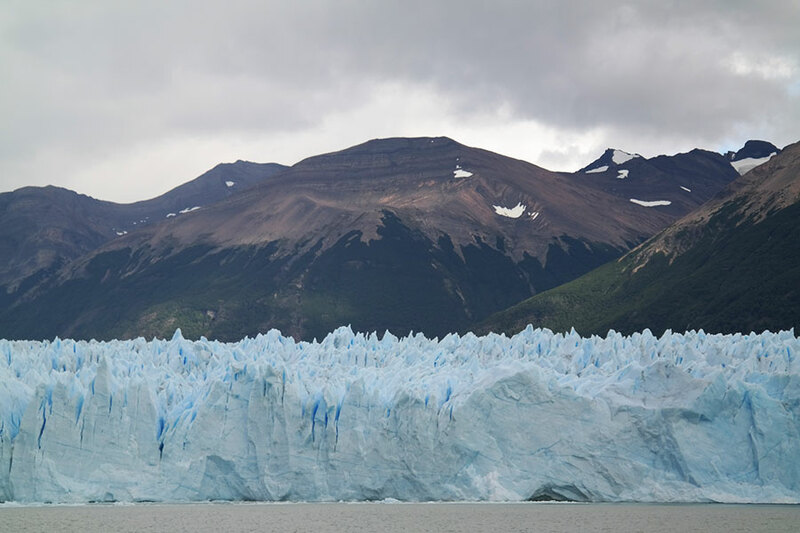 After a while, Lago Argentina fell out of view, and all we could see for miles were jagged icy peaks. 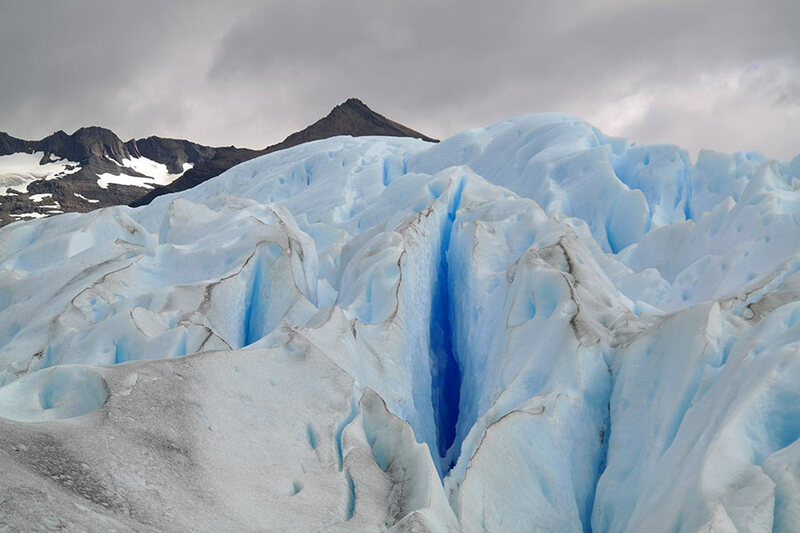 We traversed natural gullies created by melting runoff that revealed the deep blue innards of Perito Moreno. 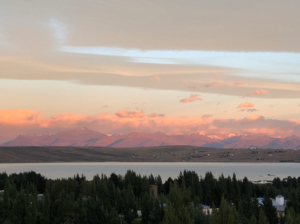 At one point, the sun peeked out from behind the clouds and cast a saturating glow over the entire landscape, intensifying the assorted hues of blue. It was utterly sublime…a gift from Mother Nature. 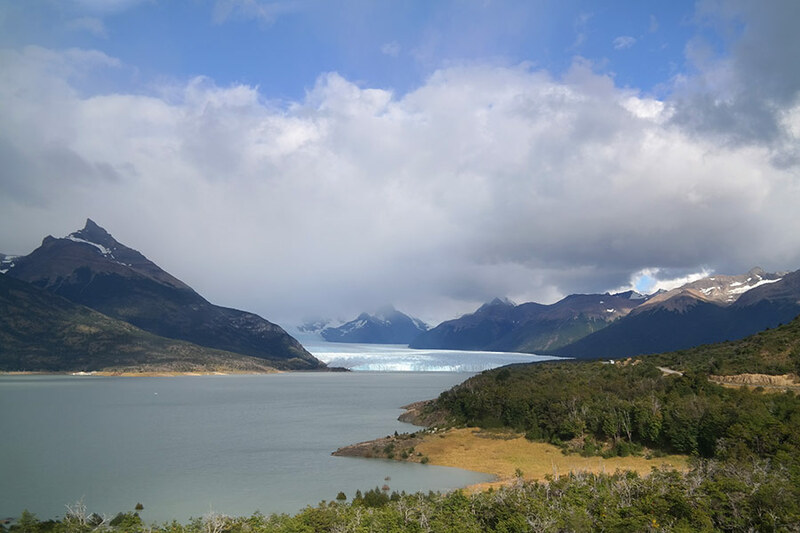 After 90 minutes or so, we began to make our descent and Lago Argentina magically reappeared below. 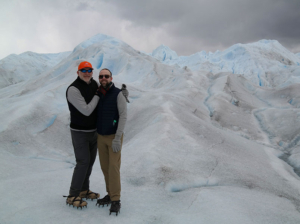 At the end of the hike, we were given whiskey on the rocks – the ice freshly chiseled from Perito Moreno – and toasted with our fellow trekkers. We then returned our crampons and made our way back through the rainforest to the landing where the boat dropped us off. 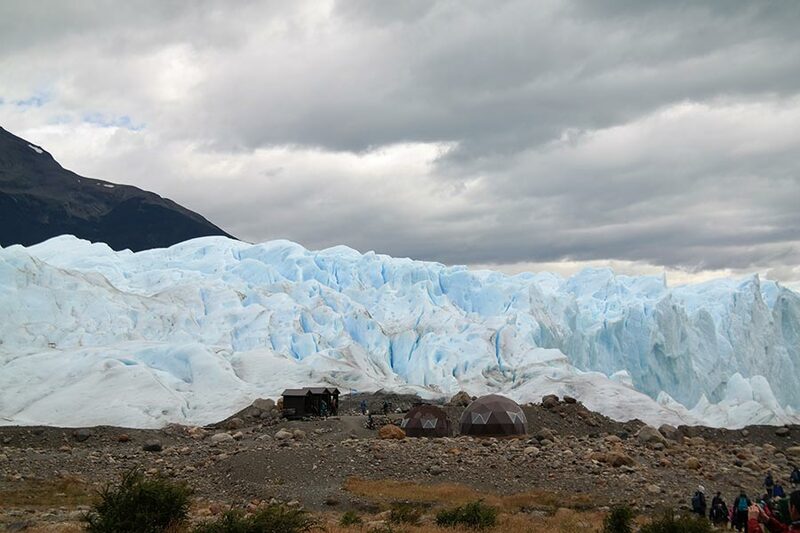 Another boat arrived shortly thereafter to whisk us across Brazo Rico to the dock, where our bus was waiting to transport the group to part two of the day’s adventures – the viewing platforms high above the glacier. 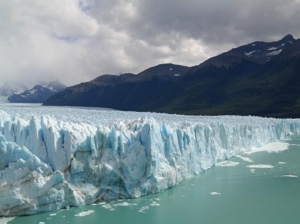 The platforms start at about 250 feet above Perito Moreno’s wall, offering an incredibly expansive view of the glacier in its entirety. 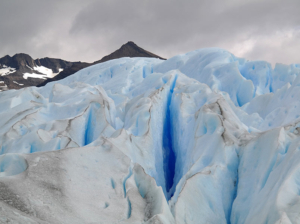 It looked like an ice-covered stairway to heaven, as Perito Moreno reached deep into the Andes and was eventually met by the cloudline. Charles and I made our way down the catwalks to a viewing platform that was just about even with the tops of the glacial wall. 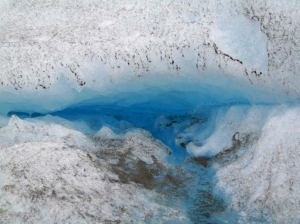 Every few minutes we heard the distinguishable cannon-like explosions of calving ice chunks tumbling into the lake below. 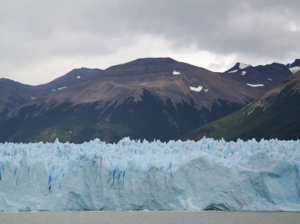 We spotted boats in the water, which looked like tiny little specs next to the sheer enormity of Perito Moreno’s glacial walls. It was truly an awesome sight…and reminder of the formidability of Mother Nature.